Blue State Coffee Latte Throwdowns: Week 1 winning latte! 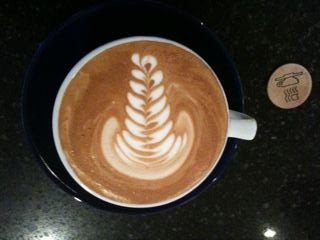 Congratulations to Matthew Morrow, the winner of the first weeks latte art contest! Excellent symmetry, depth of color, and two-tone petals on his rosetta led him to victory. The contest for week 2 (which runs 10.23- 10.29) has begun. All pictures this week must include a packet of sugar! Get pouring and come to the Barista Jam at 300 Thayer- Friday from 7-10PM! Congrats Matthew! Beautiful design, I love the thickness and roundness of the leaves. What do you win? What, a paid day off? That's awesome.